Are you one of the many people around the world who have embraced the Lenormand cards as a way of divining answers to questions? And like so many of your fellow Lenormand devotees, are you finding it hard to commit all those key words to memory? Interestingly, your ability to remember meanings and become a confident reader lies with speaking the Lenormand cards aloud. Moving from reading quietly to yourself to speaking your interpretation is a big step, but essential if you are to read for clients. In this master class, Caitlín Matthews breaks down the process of how we speak Lenormand aloud so that it can be a true oracle for the client. Because Petit Lenormand is already a linguistic oracle, based upon words rather than upon images, it enables us to use the 34 ‘speaking cards’ and the two cards that are ‘spoken about’ to great advantage. Building upon the context of the client’s question, we gain interpretive flexibility from the way the cards provide us with the words we need to interpret. The class ends with a break-down of a Grand Tableau in words and pictures showing how the big picture emerges. 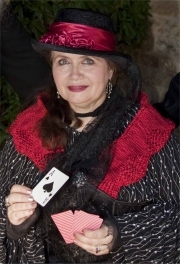 For more information on what to expect in the class, read Caitlín’s blog, Speaking the Lenormand cards aloud.